After a long-snowy-polar vortex winter, are you dreaming of blue skies and sunny days? We are! Summer is my kids’ favorite season. What’s not for them to love? My kids have three months off from school, will spend their evenings and weekends at the community pool, and hang out with the neighbor kids. As a family, we are looking forward to camping trips and a week at the beach. We bought the family a summer pass to Hersheypark for a Christmas gift, something we’ve never done before. We only live 20 minutes from the park and are really looking forward to it. Also, my husband and I have a few home projects that we would like to accomplish. Summer fun needs to be planned and a lot of it comes at a cost, so NOW is the time to start mapping out your summer. Kids (and parents) get excited about summer trips and activities, so I like to post a family calendar on the refrigerator with all of our summer plans and activities. It’s a helpful visual for everyone in my family as we were anticipating our summer fun. 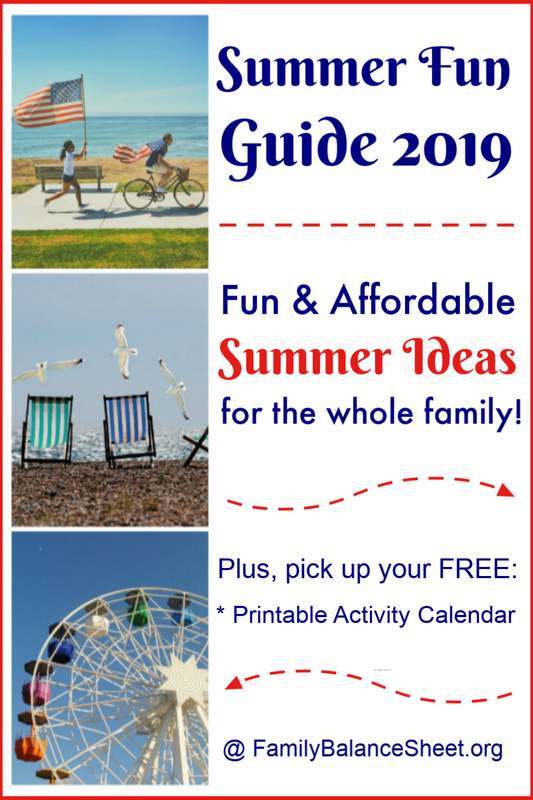 Join my email community HERE and receive FREE Printable 2019 Summer Calendar Pages. How much is summer going to cost you and your family? It can be an expensive season and it’s best to plan ahead. Start writing a budget today if you haven’t started already. Include everything from weekend trips to longer vacations, yard/garden projects, home renovations, kids’ camps, gear and clothing, and any other summer expense you might have. 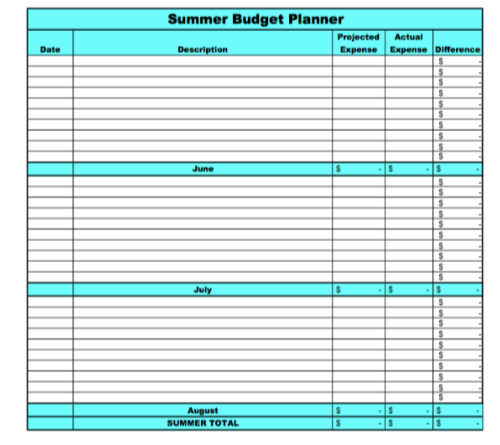 This Summer Budget Planner is included in my Family Budget Spreadsheets package. If you think you’re going to come up short on cash, check out my 25 Ideas to Find Money. Summer activities can be found all around you. Check your local community calendar, library, parks & recreation department, church, parks. 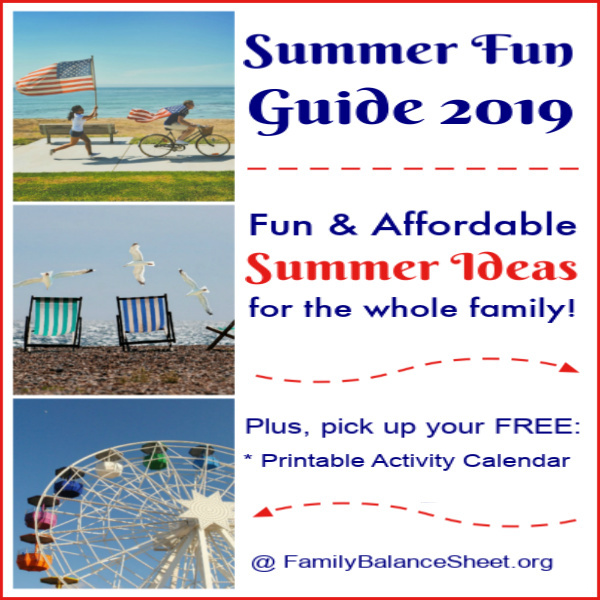 This list of summer activities are family friendly, fun, and easy on the budget. We have had fun with most of these ideas locally, but a quick Google search will help you find locations and destinations near you. Celebrate Summer Solstice on June 21, 2019, otherwise know as the longest day of the year in the Northern Hemisphere. We like to start a back yard fire to roast marshmallows and invite friends over to enjoy the long summer day. 8 Summer Date Night Ideas – Need a sitter? Swap with another family who could use a date night too. Visit a different playground each week. Why? It’s FREE and each playground visit is a new experience with different kids to play with and different equipment to explore. 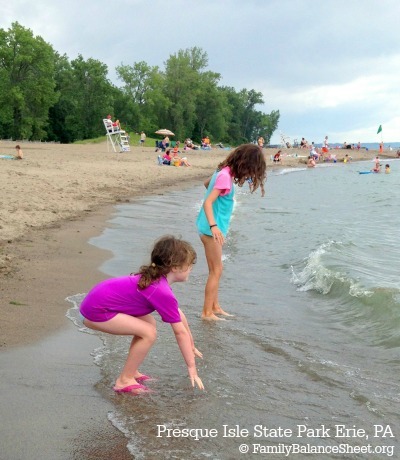 Visit a State Park – Do you like to picnic, hike, swim, camp, bike, bird watch, canoe, fish, and spend your free time exploring the great outdoors? You can enjoy all of these activities and more at a state park! Live Butterfly Garden – I wrote about this activity a few years ago and it is still a favorite summer memory. The initial kit includes the mesh garden and a voucher to order the caterpillars and food separately. You will need to time the delivery around your summer so you are home for the delivery and care. It takes about 2 weeks from the time that the caterpillars are delivered to your home to when they are ready to be set free. This might sound like a lot of work, but it was SO much fun and my kids really enjoyed setting the butterflies free. Get out on the Rail Trails. – Rail trails are old railway lines that have been converted to multi-use paths designed for pedestrian, bicycle, skating, equestrian, and/or light motorized traffic. We used to live near a trail that was very shaded and had picnic tables along the path.My state of PA has 93 rail trails that cover over 1000 miles. Visit the Rails to Trails Conservancy to locate rail trails near you. Local fairs & festivals -Look for local fairs and festivals for low cost games, food and activities. We love to go to the harvest festivals in the summer time for strawberries, peaches, and apples. Local towns, libraries, malls and fire halls also host carnivals and festivals as fundraisers. Keep your eyes and ears open for local activities. Visit an orchard. – Several local orchards in our area are fun playtime destinations with playground equipment, petting zoos, mazes, butterfly house, picnic areas, and u-pick fruit patches, such as strawberries, raspberries, and blueberries. Play miniature golf. – Look for coupons on Groupon, your local coupon magazine, the Bonus Book, or the course’s website. Hit the tennis courts. – Unless you’re a member of a tennis club, hitting the tennis courts is usually free. Find a free court, borrow or buy rackets and balls, and go play some tennis. We found junior tennis rackets at a yard sale for our kids. Get a community pool pass. – A summer pass to our community pool is $200 for my family of 4. Or, we could pay the daily per person rate of $8-$9 (weekday) or the weekend day rate of $12-$13. It would cost us $34 for my family to go on a weekday and $50 to go on a weekend day. The summer pass price of $200 is a bargain, considering we go several evenings a week and at least one weekend day. 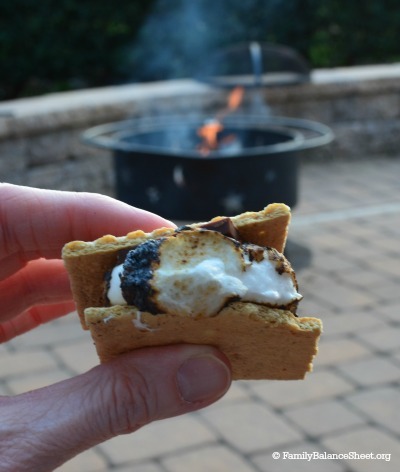 Host a backyard S’mores party. 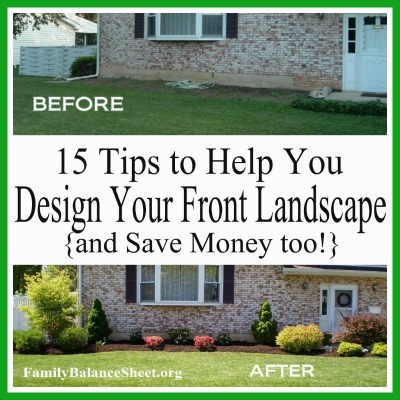 – Fire up the backyard fire pit and invite your friends and neighbors. Have a backyard game night. – Turn the screens off and get outside.We like to play croquet and bocce ball, but I found lots of ideas on Pinterest. On those days when the weather hits 90+ and the pool feels like bath water or a summer storm seems to last for days, these indoor activities will be air-conditioned, entertaining, competitive, and often inexpensive. Summer Reading Program at the Library – Check your local library for their summer reading programs. Actually check ALL the libraries close to you, because they may offer different activities and most of them will likely be free or just a few dollars. We participated in 2 library summer programs and they hosted movie nights, summer plays, visits from the local zoo, and other fun & educational activities for all ages. Museums on Us – This program offers Bank of America, Merrill Lynch and U.S. Trust credit and debit card holders the opportunity to visit more than 225 of the most popular cultural institutions in the United States free of charge on the first full weekend of every month. This is a year round program, but the 2019 summer dates are: June 1 & 2, July 6 & 7, and August 3 & 4. If you’re a card holder, check the website for the dates and list of participating museums. 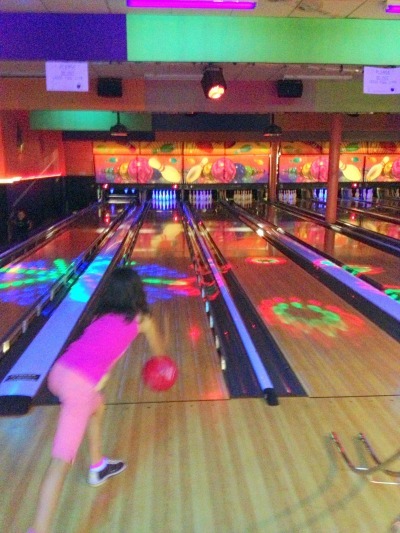 Kids Bowl Free – Registered kids receive 2 FREE games of bowling each of the summer program. Cheap Summer Movies – Some theaters are offer great kids’ movie deals over the summer months. Do a Google search for your neighborhood to find any deals at theaters near you. Homemade Ice Cream in a Bag – This is a fun frugal summer activity for the kids. How to Grill Pizza – No need to heat up the house to make homemade pizza, grill it instead! U.S. National Parks – The U.S. has so much to offer for travel destinations and there are over 400 U.S. National Parks. This post is a growing list of reviews from travel bloggers. Fun & Budget Friendly Summer Activities in Central PA – Welcome to my home state! Summer is also a time to garden, rejuvenate your landscape, and enjoy an adult beverage in your cozy back yard. I was an avid gardener for many years. In fact, in the early years of FBS, I wrote quite a bit about my gardening adventures. I have downsized my garden space recently, but my gardening posts continue to be some of my most popular. I have over 40 gardening posts in my archives, with topics ranging vertical gardening, square foot gardening, planting vegetables and herbs, composting, recipes from my gardening harvest, and more. When Summer 2019 is over, start planning for 2020! Jot down your Summer 2020 Wish List of all the activities that you didn’t get to in 2019 regardless if it was due to time or money. Follow the same principle that we use to pay for yearly expenses. Plan your budget that you want to spend on your next year’s vacation and divide by 12. That number is what you need to save each month for next year.